Come and enjoy a free multi sensory Space Experience on April 16 th at the Bozarts Gallery courtesy of the Bozarts Artists Alliance and the Water Valley Arts Council. Artist Bill Warren has invited a group of artist and space enthusiasts to participate in this show entitled SPACE. 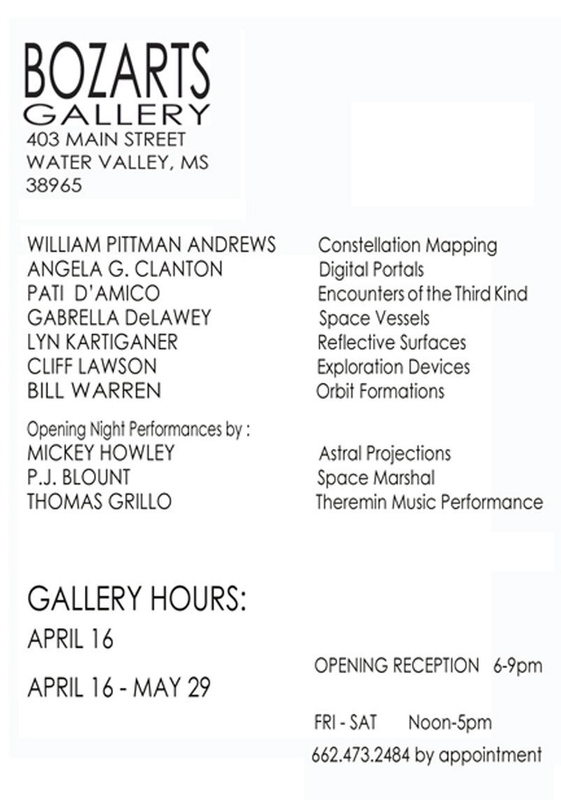 On opening night, Water Valley’s Space Law Man, P.J. Blount, will introduce the multimedia show on space exploration inspired by the amazing discoveries of the Hubble telescope. The other artists included in the display are William Pittman Andrews , Pati D’ Amico, Gabriella De Lawey, Lyn Kartiganer, and Bill Warren and Angela G. Clanton. 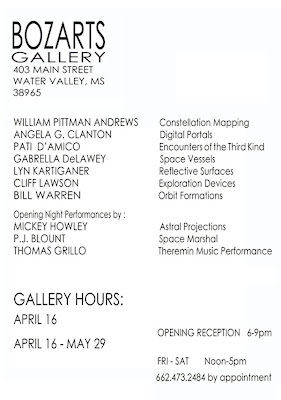 At the opening reception, Thomas Grillo, Mississippi’s finest player of the Theremin (an electronic musical instrument) will provide a spacey musical backdrop for the evenings events. 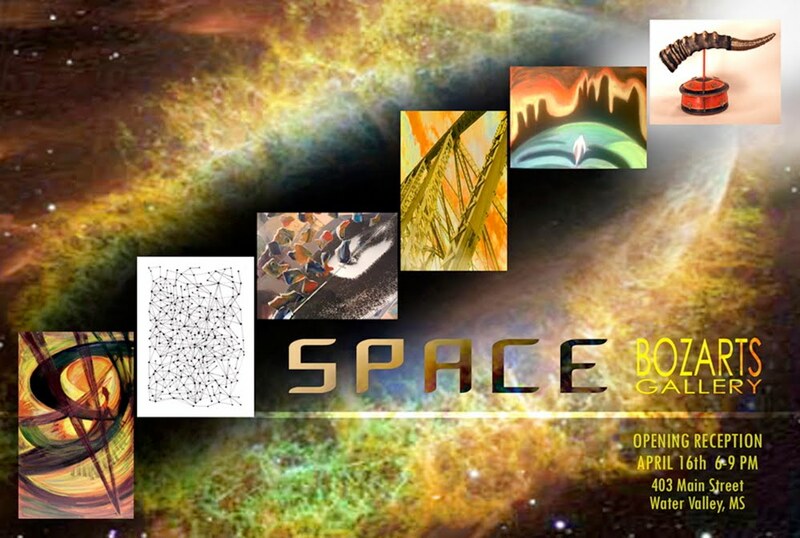 Mickey Howley will be projecting astral video images on the big screen and several pieces from Cliff Lawson’s rocket collection will add to the out of this world ambiance. Put it on your calendar and start the countdown now! That’s FRIDAY, APRIL 16 th, 6-9 pm., at the Bozarts Gallery, 403 Main Street. The show will remain on display through May 29th. The public is encouraged to attend this free event. For more information please contact Bill Warren, at 662 -473-0972. And remember that SPACE IS THE PLACE. BASS DRUM OF DEATH - "HIGH SCHOOL ROACHES"